The cynomolgus macaque is the most commonly utilized non-human primate in biomedical research. According to some researchers, these monkeys are ideal models due to the 90-93% genetic similarity to and recent evolutionary divergence from humans. They are employed in numerous research areas, such as immunology, neuroscience, oncology, diabetes, and pharmacology due to their genetics and physiology. 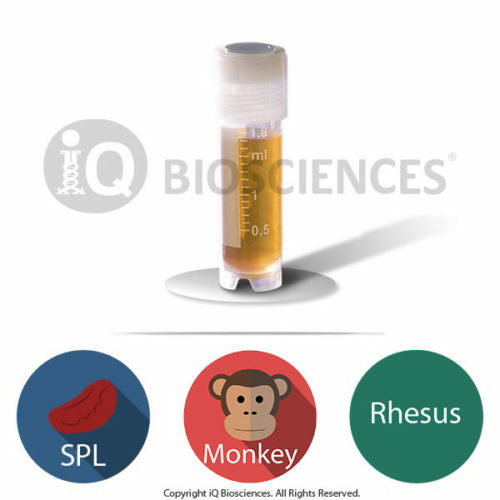 CD14+ cells make up approximately a third of cells in the blood of a typical adult monkey. Monocytes and neutrophils typically make up the cells that express CD14+ cells. When activated, monocytes can phagocytose foreign cells and perform antibody-dependent cellular phagocytosis (ADCP). They can also produce and secrete inflammatory cytokines. Developmentally, monocytes can mature into macrophages and dendritic cells depending on the soluble factors they are exposed to in order to become more specialized immune subsets. Neutrophils are a subtype of granulocytes, which can also perform phagocytosis of microorganisms and secrete enzymes to destroy them. 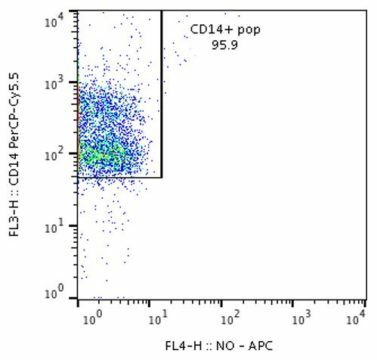 Purified cynomolgus CD14+ cells are a good source of cells to study the biology of monocytes and their role in the immune system since they make up approximately 50% of CD14+ cells. These isolated cells can be used to examine the differentiation and development of the monocyte population to the macrophage or dendritic cell subsets depending on the cytokine environment. Further, these differentiated cells and monocytes can also be used for stimulation-dependent functional experiments to assess cytokine production and antigen presentation. Similarly, isolated CD14+ cells are a good source of mature neutrophils to study their biology, in particular their functional capabilities. They are capable of secreting enzymes, as well as performing phagocytosis in response to foreign organisms. With the current trend toward development of immuno-modulatory drugs, CD14+ cells are an ideal source of cells to test inflammatory factor production in the presence of therapeutic molecules. More importantly, these cells can be used to assess toxicity and safety characteristics of these biologics before first in-human trials as these cells can be employed in pre-clinical settings to ensure the biologics are not eliciting unwanted monocyte or neutrophil-mediated functions. Cynomolgus PBMCs were sourced from a responsible third party vendor that operate according to local regulations and laws. To purify cynomolgus CD14+ cells, PBMCs were incubated with antibodies against CD14 and subsequently passed through a magnetic column. The cells that pass through are the non-CD14+ cells, which can be used for other purposes, while the labeled CD14+ cells are left bound to the column. These cells are subsequently eluted to obtain purified CD14+ cells. 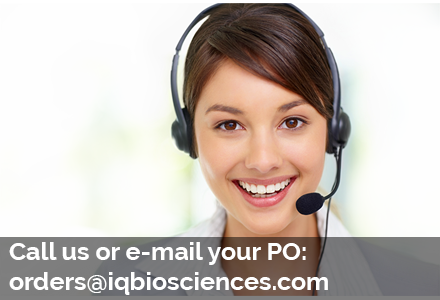 Contact us for more information about purchasing our magnetically isolated CD14+ cells. A small aliquot of Cyno CD14+ cells was tested for post-sort purity by flow cytometry analysis. Purity of CD14+ cells, as defined by CD14+ expression, was > 95% (Figure 1). Figure 1. Purity of CD14+ cells after magnetic isolation from cynomolgus PBMCs. Cynomolgus PBMCs were incubated with antibody against CD14 and then subjected to magnetic separation to obtain CD14+ cells. A small aliquot was taken after selection to evaluate post-sort purity by flow cytometry. Purified CD14+ cells were cryopreserved carefully using iQ Biosciences’ cryopreservation protocol that ensures high viability (> 90%) after thawing. Cells should be stored at < -120 °C once they are received, such as within a liquid nitrogen tank (vapor phase).